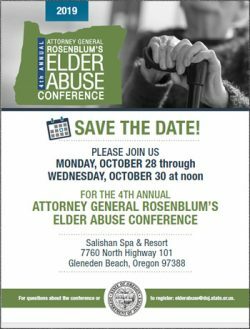 Save the Date for the 4th Annual Attorney General Rosenblum’s Elder Abuse Conference! Monday, October 28, 2019 through Wednesday, October 30, 2019 at noon. Salishan Spa & Resort, 7760 North Highway 101, Gleneden Beach, Oregon 97388. For questions about the conference or to register, email elderabuse@doj.state.or.us. Fighting elder abuse is a top priority for the Oregon Department of Justice (DOJ) and Attorney General Ellen F. Rosenblum. It is especially important as Oregon’s population of older residents continues to grow. In 2014, an estimated 16 percent of Oregonians were 65 or older. By 2030, that number is expected to rise to 20 percent. Reports of possible elder abuse are also rising. In 2014, more than 38,000 cases of possible abuse were reported in Oregon, according to the Oregon Office of Adult Abuse Prevention and Investigations ». In 2015, this number grew to 43,000 cases – a 13 percent increase in one year. Nationally, financial abuse costs older adults billions of dollars. Various studies estimate the cost from $2.9 billion per year to many times that amount. Women were nearly twice as likely to be victims of elder financial abuse as men. The Oregon DOJ has taken strong steps to address and prevent this growing epidemic and hold perpetrators accountable. In September 2016, AG Rosenblum appointed Oregon’s first statewide elder abuse prosecutor. Oregon is only the third state in the country to have a statewide prosecutor devoted entirely to elder abuse. Funding for the new Elder Abuse Unit was the AG’s highest priority for the 2016 legislative session. The Elder Abuse Unit, led by former Malheur County District Attorney Dan Norris, works with Oregon’s 36 district attorneys and other prosecutors, law enforcement and community partners throughout the state. The Elder Abuse Unit works with the Oregon DOJ’s Medicaid Fraud Unit » and Consumer Protection Division », which aggressively pursue individuals who victimize elder Oregonians. The Oregon DOJ also invests in education and outreach to help seniors avoid financial exploitation, fraud and scams. A statewide speaker program helps Oregonians recognize fraud and abuse, making them less likely to become victims. Victims of elder abuse may be slow to recognize and report the abuse. Too often, victims suffer in silence. For that reason, it is important to recognize the following warning signs. Any unexplained injury, or an injury that doesn’t fit with the given explanation. Situations where the elder is not given the opportunity to speak for herself or himself without the presence of the caregiver. Elders who become extremely withdrawn, non-communicative or non-responsive. Frequent arguments between the caregiver and elderly person. Unpaid bills, overdue rent, utility shut-off notices. Possible elder abuse should be reported through Oregon’s toll-free hotline: 1-855-503-SAFE (7233) or on the DHS website ». If it is an emergency please dial 9-1-1. Oregon attorneys have a mandatory duty to report elder abuse under certain conditions. Read more about Oregon attorneys’ mandatory duty to report elder abuse (PDF) ». Visit the abuse complaints database to search Substantiated Facility Abuse Complaints ». Some cases of elder abuse also involve Medicaid fraud.